We have decided to start sharing with you some online chocolate making classes! 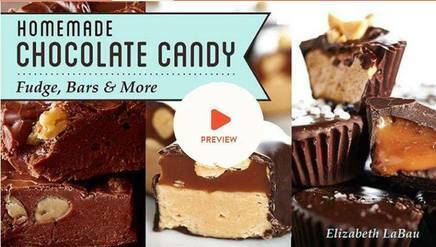 Discover the secrets to whipping up decadent fudge, homemade candy bars and more amazing treats, all in your very own kitchen and all to rave reviews! We will be posting a link monthly, so watch for them! Our first link is a class called "How to Make Candy Bars". Turn what you learn in this class into delicious traditions for years to come! Join cookbook author and candy-making expert Elizabeth LaBau as she shares her tried-and-true techniques for delectable homemade candy. First, learn Elizabeth's foolproof methods for perfectly tempering chocolate for quick bars and clusters. Then, create ganache for tasty truffles and whip up your best caramel yet. Did you ever think you would make your own marshmallows? It's easy with Elizabeth's simple techniques for fluffy marshmallow pops, mini-marshmallows and the perfect s'mores. Plus, master peanut butter cups from scratch, take the fear out of making classic fudge and create homemade candy bars your loved ones won't be able to get enough of.